Now that you have the power, you need the cords! Wylaco can help you out! CEP carries a large assortment of cords we do not have listed. Due to the fluctuating markets of various metals we would need to quote you a price. Here is a link to all items offered by CEP. Length: 100 Foot Gauge: 10/3 Type: SOW Nema: L6-30 Amp/ Volt Rating: 30 Amp 250 Volt T/L Black Rubber Jacketed .. Length: 50 Foot Gauge: 10/3 Type: SOW Nema: L6-30 Amp/ Volt Rating: 30 Amp 250 Volt T/L Black Rubber Jacketed .. Catalog Number: 1080 - 2ft. W Adapter U-Ground Catalog Category: Generator Cords Length: 2 Feet Gauge: 12/3 Jacket Type: STW Plug: L5-20 Outlet Quantity A: 3 Outlet(s) A: 5-15 Does Not Meet N.E.C Requirements .. Catalog Number: 1081 - 2ft. W Adapter U-Ground Catalog Category: Generator Cords Length: 2 Feet Gauge: 12/3 Jacket Type: STW Plug: L5-30 Outlet Quantity A: 3 Outlet(s) A: 5-15 Does Not Meet N.E.C Requirements .. Catalog Number: 1082 - 2ft. W Adapter U-Ground Catalog Category: Generator Cords Length: 2 Feet Gauge: 12/3 Jacket Type: STW Plug: L5-20 Outlet Quantity A: 3 Outlet(s) A: 5-15 .. Length: 100 Foot Gauge: 12/3 Type: SOW Nema: L6-20 Amp/ Volt Rating: 20 Amp 250 Volt T/L Black Rubber Jacketed .. Length: 50 Foot Gauge: 12/3 Type: SOW Nema: L6-20 Amp/ Volt Rating: 20 Amp 250 Volt T/L Black Rubber Jacketed .. Length: 100 Foot Gauge: 12/3 Type: SOW Nema: L5-20 Amp/ Volt Rating: 20 Amp 125 Volt T/L Black Rubber Jacketed .. Length: 50 Foot Gauge: 12/3 Type: SOW Nema: L5-20 Amp/ Volt Rating: 20 Amp 125 Volt T/L Black Rubber Jacketed .. Length: 100 Foot Gauge: 10/3 Type: SOW Nema: 5-15 Amp/ Volt Rating: 15 Amp 125 Volt Straight Black Rubber Jacketed .. Length: 50 Foot Gauge: 10/3 Type: SOW Nema: 5-15 Amp/ Volt Rating: 15 Amp 125 Straight Volt Black Rubber Jacketed .. Length: 100 Foot Gauge: 12/3 Type: SOW Nema: 5-15 Amp/ Volt Rating: 15 Amp 125 Volt Straight Black Rubber Jacketed .. Length: 50 Foot Gauge: 12/3 Type: SOW Nema: 5-15 Amp/ Volt Rating: 15 Amp 125 Volt Straight Black Rubber Jacketed .. Description: This is a 100' 6/3-8/1 SOW 50A power cord. This is an extremely heavy duty power cord most often used in conjunction with a Spider Box like the CEP 6506-GU Spider Box. This item is made in the USA and new in its original packaging. ..
6408M - 2ft. 30A 125/250V Straight to 50A 125/250V Twist Catalog Category: Generator Cords Length: 2 Feet Plug: 14-30 Outlet Quantity A: 1 Outlet(s) A: 6364C Connector .. Catalog Number: 6409M - 2ft. 50A 125/250V Straight to 50A 125/250V Twist Catalog Category: Generator Cords Length: 2 Feet Plug: 14-50 Outlet Quantity A: 1 Outlet(s) A: 6364C Connector .. 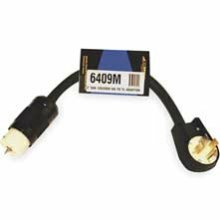 Description: This is a 50' 6/3-8/1 SOW 50A power cord. This is an extremely heavy duty power cord most often used in conjunction with a Spider Box like the CEP 6506-GU Spider Box. This item is made in the USA and new in its original packaging. ..
Temp Power Y Adapter Catalog Category: Temp Power Cords Length: 2 Gauge: 6/3-8/1 Jacket Type: SOW Jacket Material: RUBBER Pack: 1 Weight: 5.00 Color: BLACK Plug: 6365C Plug Outlet Quantity A: 2 Outlet(s) A: 6364C Connector ..
100' 6/3-8/1 STOW CablePlug Type: 50 AmpReceptacle Type: 50 AmpPower Rating: 40 Amp, 10,000 Watt..